Doug and Ruth Weber and family, UB endorsed missionaries serving with Radio HCJB in Ecuador, returned to the States this summer, and have decided to delay their return to Ecuador until January 2010. It will be classified as a medical leave. They are facing medical bills not covered by their insurance. Doug wrote about it on his blog. Huntington University has appointed six new faculty members for the fall of 2009. Dr. Jonathan Bratt accepted the position of assistant professor of physics. Bratt recently earned a Ph.D. in physics from the Massachusetts Institute of Technology. He obtained Bachelor of Science degrees in physics and applied mathematics in 2003 from Geneva College in Beaver Falls, Pa. Bratt has taught courses in experimental physics, quantum physics and electrodynamics. His doctoral research was focused on the study of nucleon structure using lattice quantum chromodynamics. Shahbaaz Shah will work with the digital media arts program as a visiting professor. Shah is a character animator whose experience includes such films as “Transformers 2: Revenge of the Fallen,” “The Legend of the Santa Claus” and “Horton Hears a Who!” as well as video games based on the movies Disney’s “Bolt,” and “The Bourne Conspiracy.” He earned a Bachelor of Arts in media arts and animation from the Art Institute of Colorado in 2004 and a diploma in advanced studies in character animation from Animation Mentor in 2007. Dr. David Alexander accepted the position of assistant professor of philosophy. Alexander earned his Ph.D. in philosophy and Master of Arts in philosophy from Baylor University in 2008 and 2005, respectively. He has served as an assistant professor of philosophy at Calvin College and an instructor in philosophy at Baylor University. His areas of specialization include ethics and metaphysics. He also has achieved competence in the philosophy of religion, epistemology, the history of modern philosophy and medieval philosophy. The Rev. Dr. Kent Eilers will step into the role of assistant professor of theology. Eilers was awarded a Ph.D. in systematic theology from the University of Aberdeen in Aberdeen, Scotland. He earned a Master of Divinity degree at Denver Seminary in 2004. Eilers has served as an adjunct faculty member at Denver Seminary and Colorado Christian University. He also served on the pastoral staff of Woodman Valley Chapel in Colorado Springs. Eilers is the co-author of the forthcoming book, “Looking Back, Moving Forward: Evangelical Theologies of Retrieval” (InterVarsity Press). Dr. Yu Yan will serve as an assistant professor of mathematics. Yan holds a doctorate in mathematics from Stanford University and a bachelor’s degree in mathematics from Fudan University in Shanghai, China. She has served as an assistant professor at Houghton College and a postdoctoral lecturer at the University of British Columbia in Vancouver, Canada. Her research has been published in Mathematical Research Letters, Communications in Contemporary Mathematics and the Pacific Journal of Mathematics. Father Rick Leone has accepted the position of visiting instructor in psychology and sociology. Leone has taught at Indiana University-Purdue University Fort Wayne in the Human Services Department, at Ivy Tech in the Sociology Department and has worked at SouthernCare Hospice providing pastoral care, social services and bereavement services for clients and families. He also served at Crossroad Children’s Home as the director of pastoral care, as an outpatient therapist for TriCity Mental Health Care in East Chicago, Ind., as well as part of the Intensive Outpatient Program and an inpatient therapist for Charter Hospital in Hobart, Ind. Leone received his Bachelor and Master of Social Work degrees from Valparaiso University and Loyola University in Chicago, respectively. In addition, he holds a Master of Divinity degree from California’s Anglican Theological Seminary. He pastors Our Glorious King Anglican Church in Huntington and the Anglican Fellowship of Fort Wayne. The Pastor’s Familiarity Tour to Israel still has slot for four senior pastors; 13 have been filled. Denny Miller is leading this trip February 19-26, 2010. Last Thursday I attended a Communications Roundtable in Indianapolis. It’s a bi-monthly group of people who do communications for large churches. The sponsor is Fishhook, a really wonderful Christian communications/branding firm in Indy. Newspapers are in a time of change. They are trying to do more (like adding websites) with fewer people. If you want them to cover an event, give two weeks of lead time. Be understanding if they can’t cover your church event. Newspaper people aren’t able to get out as much as in the past. Newspapers are reducing the size of their printed papers, and writing shorter, more tightly-written stories. Understand that editors and reporters get scores of phone calls, emails, and voice messages while working on strict deadlines. It’s easy for things to slip through the cracks. Leave short voice messages, and identify yourself and your church clearly. They are always looking for digital material, such as video and photos, that they can use on the web. They appreciate when you suggest stories and story angles. They prefer stories about people, rather than about institutions. Understand that their main responsibility is to their readers. They are looking for the angle that will make the story most interesting to the bulk of their readers. Develop a relationship with reporters and editors. Don’t just pitch them information to get free publicity. Relationships will serve you much better in the long run. Don’t bombard them with information about every little church event. We get excited about what’s happening in our church and want to throw it all out to the public. But before long, they’ll just begin ignoring your submissions. Be strategic in suggesting stories. Once a quarter is good. A good story angle: how something your church does ties into trends, topics, and issues of interest to the entire community. Help the reporter by providing people who can talk about the issue or event, and suggest visuals (like photos). What reporters see as fair and objective may not seem that way to you. Trust their judgment. They’re not out to get you. They’re just ordinary people who probably attend a church near you. Greg Helman, senior pastor of Blue Rock UB (Waynesboro, Pa.), reports: “Blue Rock Church has hired Adam Lane as their new worship/music director. He is a recent graduate of Huntington University with a degree in worship leadership. His expertise and humble heart will complement the growing ministry that God is doing at Blue Rock. Adam and his wife, Shalom, live in nearby Hagerstown, Md. 26 Aug How Does God See the Future of Your Church? Vision involves seeing your church’s future through God’s eyes rather than your own. We easily focus only on what we can see and do. We look at what has happened at our church in the past, and we assume the future will be the same way. As a result, we frequently repeat history. But vision provides a brand new picture for your church. It gives you hope that transcends the image that past history paints. It shows you what could be, even if you can’t touch it or totally figure it out. It opens a window in front of you that is different from anything that you have seen before. As we embark on the journey of life that God has placed before us, I challenge you to seek God’s heart for your individual church. Look beyond the limits you have always seen in the past. Catch a glimpse of what God wants to place deep in your heart. Give birth to the vision of what God wants to do. Find the foundation for your vision through studying his Word. When God’s truth and the vision connect, then run toward the picture that is there. We then should praise our God for allowing us to see the reality of the vision that he had in mind for us all along. On Monday and Wednesday mornings, the Healthy Ministry Resources staff starts the day at 7 a.m. with a devotional time. We share updates from our lives, and from things we’ve heard across the church. The persons who travel a lot usually bring back stories from the churches and mission fields they visit. Phone calls and emails bring additional information. We read from a devotional book, which this year has been Robert J. Morgan’s “From This Verse.” Then we pray. Brooklyn Park UB in Baltimore (John Christophel, pastor). Bethany House of the Lord in Cumberland (Michael Mudge, pastor). We’ve been doing this for over a decade. The national office staff exists for our churches, and praying for you is one way we keep that mission central. Pastor Tim Hallman prepares to unleash the kids, ready to part with their toys. On August 17, 2009, Pastor Tim Hallman of Anchor Community Church (Fort Wayne, Ind.) 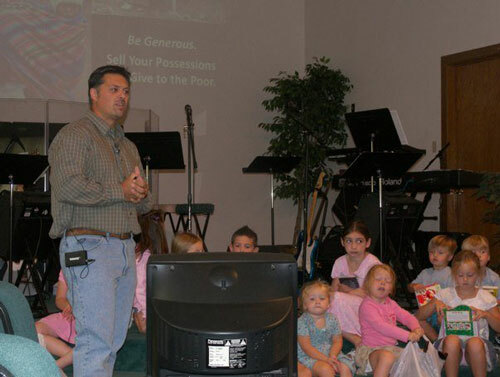 preached from Luke 12:33, “Sell your possessions and give to the poor.” The message was directed at children, who gathered around the front of the church. He gave them an assignment: go through their toys and bring some to church the next Sunday. We would then sell the toys and give the money to the poor–specifically, to a micro-business opportunity in Peru which would benefit a poor family. The money would be channeled through UB endorsed missionary Anna Geivett, who serves with Food for the Hungry in Peru. $25 buys a fruit-bearing tree which can produce hundreds of pounds of food each year, helping feed that family and produce additional income. $20 buys 4 rabbits, which can become 80 rabbits in one year’s time. $40 buys a sow, which can produce 20 piglets each year, yielding income for the family. In just six months, each piglet can grow to 200 pounds. $150 buys a dairy goat, able to produce up to a gallon of milk each day. On August 23, the children showed up with all kinds of toys, books, stuffed animals, and other items. After a short message, Tim told the children to walk through the sanctuary with their toys. Adults then bought the items from the children–a quarter, a dollar, a couple dollars. The kids then brought their money to the front of the church, where it was counted. Over a period of about ten minutes, the children sold all of the possession they had brought. When it was all counted, the total raised came to $241–enough to finance each of the four projects! It was a great lesson not only for the children, but for adults, who have much bigger toys which could be sold to benefit someone in need. 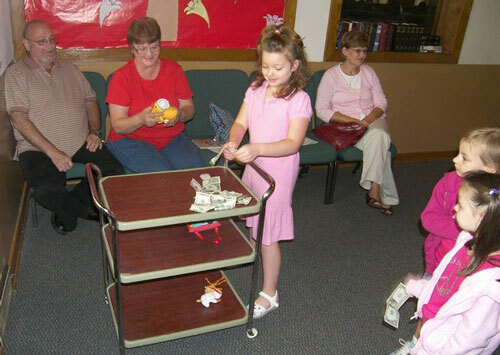 Emily brought a whole bag of stuffed animals, which she placed on this cart and wheeled around the sanctuary until they were all sold. 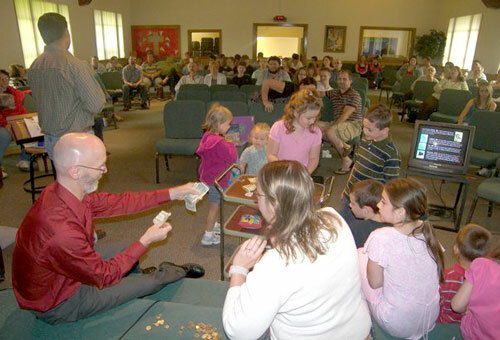 Two adults count the money as kids bring it to the front of the church. Church legal expert Richard Hammar talks about the 10 greatest legal issues facing today’s churches. Here’s the list. The article, on the Brotherhood Mutual site, gives brief explanations of each, along with good links for additional reading. 1. Negligent selection of youth workers. 4. The duty to warn (giving employment references). 8. Employment liability: the ministerial exception (staff classified as clergy). 9. Discrimination based on morals or religion. 10. Automatic excess benefit transactions (taxable fringe benefits for pastors). For the 15th consecutive year, U.S. News & World Report listed Huntington among the top-tier schools in the region. This year, we moved up one spot to #6 among the “Best Baccalaureate Colleges in the Midwest.” As the lowest-priced Indiana college in this category, we also earned recognition as one of the Top 5 “Best Values” in the region. For the second time, Huntington was ranked among the Top 100 colleges in America, according to Forbes.com. This is a tough list to make, as the competition includes both private colleges and public universities. Huntington was one of only two intentionally Christ-centered campuses among Forbes’ Top 100. College rankings are often controversial and their methodologies and merits subject to debate. However, we do feel honored to have been recognized by such prestigious organizations as US News, Princeton Review, and Forbes. I am very grateful to the Lord and His people for helping Huntington University to be a school recognized for Christ-centered excellence.